The jam filled center softens these cookies making them tender, flaky and irresistible. And just in time for Valentines Day! I loved the lingonberry preserves from Ikea which are slightly tart and complimented the cookies perfectly! You can use any kind of jam to fill these; raspberry, peach, apricot, or use several to make a beautiful array of colorful cookies. You can also make any shape you like; hearts for your Valentine, stars for July 4th, etc. In a large mixing bowl, add 3 cups + 2 Tbsp flour and 2 sticks softened butter and mix the dough together with your hands. It's actually feels kind of nice to get your hands in there (let me know if you agree). Rub the dough between your fingers until it becomes a sandy texture with fine crumbles. P.S. Oksana recommended that you use your hands for best results rather than a mixer. In a separate mixing bowl, add 2 eggs and 1 cup sugar and mix on high speed 5 minutes until pale yellow and smooth. Pour this mixture over the flour and mix gently with a spatula just until well incorporated. Divide the dough into 4 pieces and roll out one piece at a time keeping the rest of the dough covered at room temp. Sprinkle a clean non-stick surface and your piece of dough generously with flour and roll it out to an 1/8" thick round. If your dough is sticky when rolling, just add more flour. Use a any shape of cookie cutter you like to cut out shapes. I used a fluted one. Transfer cookie shapes to a cookie pan lined with parchment paper. Collect the scraps and blend them back into your remaining dough. Poke a hole in half of your cookies (all I had was a straw so I poked the hole and then worked it around to make a 1/3" opening. Keep in mind the hole shrinks quite a bit so make it bigger than you think it should be. I kinda wish my hole were bigger. So, you will have 24 cookies with holes and 24 without. Bake at 350˚F for 5-8 minutes or until lightly golden on top. Watch them closely since they turn golden quickly. Remove from the oven and let them cool to room temp. I baked in two batches. 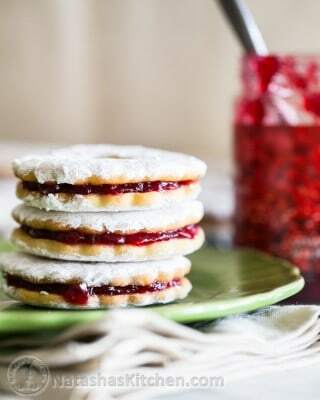 Once the cookies are room temp, spread your jam onto the base of the cookie and top with the poked cookie. Press the sides together, then dip both sides in powdered sugar. These cookies can be eaten right away but are even better a few hours later or even the next day after they've had a chance to soften from the jam.